H&H Homes – Conversion Page Development | ASTRALCOM - Content Strategy, Conversion Marketing and Customer Acquisition. H&H Homes – Conversion Page Development | ASTRALCOM – Content Strategy, Conversion Marketing and Customer Acquisition. There’s one competitive differentiator that most builders have not leveraged in ways that demonstrate real and enduring value to their potential homebuyers. Energy-efficiency is often cited as the second most important aspect of buying a new home because the cost of utilities is an ongoing expense for every homeowner. By doing a little math and wrapping it in a creative application, we can quickly demonstrate true value and create an engaging, personalized user experience. 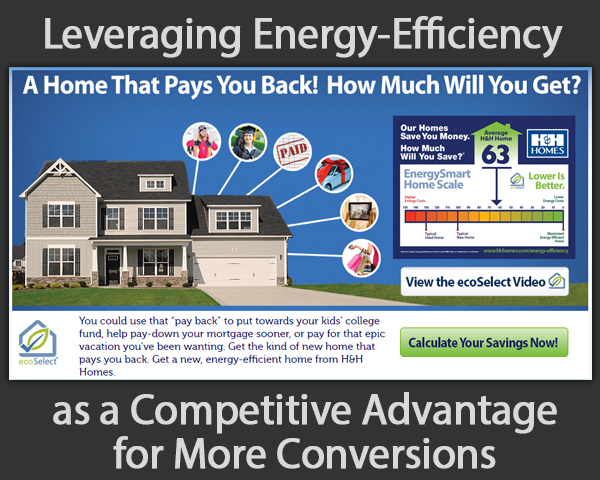 This competitive differentiator creates an inspiring experience and helps demonstrate real savings, unique to each homebuyer.